Making a homemade screen out of my sheer fabric worked so well, I decided to buy some larger frames with stretched and primed canvas. You can often find them reasonably priced in art and hobby stores in two packs. Even Walmart has some smaller sizes. I took a razor knife, and cut the canvas off at the stapled area on the back. I carefully set it aside to use for something else. Start with the middle of each side, and add a couple staples using an electric stapler and 3/8" heavy duty staples. Go to the opposite side, stretch tightly, and add staples there to balance. Gradually work your way out from each side and its opposite to the corners. Trim the excess fabric near your staple work. Ta-Dah! Lay your newly created frame down on the table, with the well area facing you. (The screen and frame on the bottom will be completely flush with the table.) Using a variety of items for texture, compose your screen. You can see above I've used some onion netting, waffled packaging paper, round discs that gave wonderful images and perhaps some bubble wrap there. Not every bit must be filled, but I found even some very subtle texture is preferable to none at all. You'll be lifting your screen up and down to move things around, but try to be fairly careful as things shift easily. Also, you're placing objects with some dimension behind your screen. Be sure not to puncture it. I found that running my hand across the side of the screen facing me would help to give an idea of where the higher spots on the screen were, and where I would have the most color. I think this one piece is counter-intuitive, and after screening with a friend who was relearning, she definitely agreed. The Procion MX dyes were dissolved, and mixed with print paste to thicken. I chose between 2 and 3 colors for each screen, and laid them out fairly heavily across the well. Then using a squeegee, I pushed the thickened dyes into the screen to create contact with the resist materials beneath it. So, technically there was not print, but I was creating a screen. Here's the view from the well side of the screen. You can see how the areas without much resist--or materials, have dried already. The areas with resist have collected more dye, and are taking longer to dry. At this point, I went into the edges of the screen, and cleaned them up. These screens were also made earlier, and were set in front of a box fan to dry. At this point, I gently removed the materials from the back with great care as to not cause any wet dye to run if it was not yet tacky. The resist used in the blue piece was simply torn kraft paper from recycled packaging. The red piece was my first, and very experimental. I didn't believe I had enough resist materials, but you'll see even subtle texture prints fairly well. A completely dried screen is best for printing. Mine dried nearly 24 hours before I made my first pull. There should be no tackiness to the dyes, and one thing I found to look for was the urea in the print paste crystallizing. I explained it to a friend who was unaware of what urea is: It looks like a pee puddle from a dog you missed cleaning, and the urine has crystallized though there is no liquid. 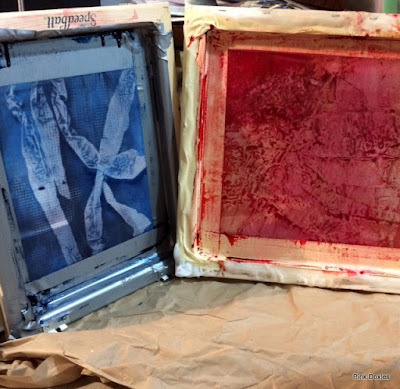 I used soda ash soaked Kona cotton, pressed it well, then taped it to my print table. Clear print paste was added to the well, and I primed the screen here before the first print. This screen was heavy with dye in strong colors so I got 4 good contrasting pulls, and 2 more when I was working to pull all the dye out of the screen. I think it's really interesting to see how the print changes over the course. The lightest print at the bottom right corner was the first with the one above it second. The thinnest amount of dye on your screen, that with no resist or materials having been behind it, is the first to print, ending with the areas of greatest concentration that you see. While I have no finished pictures ready this morning, I will leave you with another little tease. Another palette, and two different screens produced these prints. And while a friend was here printing with me, we ran out of Kona, but tried some silk noil, brushed twill, and paper. You'll have to wait until I get my breath, but that will all be coming next, along with some more basic printing. Today's your last day to link up with June's #BraveQuilter. I hope I've inspired you to do some kind of printing this month, or another area you've been thinking about that's right for you. You seem to be taking to all this messiness with great success!! You know I have had a screen made and ready to try this printing for probably 10 years now. It's on the shelf in my garage. I really should just give it a go at least once. Thanks for the inspiration! OMG! I recently purchase a ton of screen printing stuff and have been debating and debating what i really want to do. Problem is that to burn new screens all I have is the sun and have been too nervous to give it a go yet. BUT this is another AMAZING option! Thank you thank you thank you for sharing! These are some of the best that I have seen! Way to go! Wow, lovely prints!! Well done. I'm amazed by the resulting prints. Very, very interesting! I look long and hard at you blue and red prints. And then you showed your new palette... This last one is incredible. That's so kind of you to say, France. I think I am drawn to these because of the fun I have picking apart how they're done. I think another post needs to show the odd assortment of items that make up the resist on the screen. It's very surprising to see what it is. That's such a nice compliment, and thank you very much. I do appreciate it deeply. Then I'm doing my job. I would advise you to try a lot of different, easy things, and just see what happens. I know it sounds silly, but just figuring out the pressure to use on your squeegee, or how much paint or dye to put in your well aren't the things you want to be learning while pulling an important print. Go through taping your screen, mixing some colors, and using different stencils. It was more challenging than I thought to get it all right, and make it happen like it was supposed to. Just play, learn, and have fun. Very cool prints. It's been interesting to see how each method works.